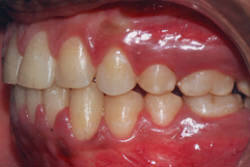 Introduction: Management of hypodontia especially involving upper lateral incisors in orthodontic patients can pose a challenge in orthodontic management. 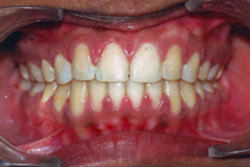 Canine substitution is a clinically accepted method wherein the canines are moved into the position of the lateral incisors and subsequently their morphology is altered to resemble the lateral incisor .Methodology: An 18 year old female patient exhibited missing maxillary lateral incisors bilaterally, midline diastema and spacing in the upper anterior teeth. 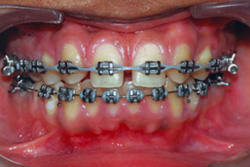 Pre-treatment radiographs (OPG and Cephalograms) were taken. 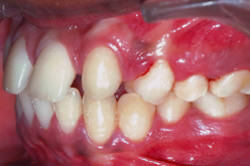 The treatment plan involved substitution of the missing lateral incisors with the maxillary canines. The patient was treated with the MBT technique. Finally post treatment records were made and compared to the pre-treatment records. Results: The canines have been moved to the lateral incisor position and they have been converted to resemble lateral incisors with satisfactory results. 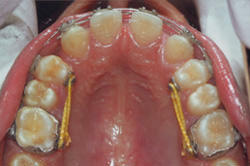 All dentoalveolar and skeletal changes have been brought about without any additional intra oral or extra oral device. Conclusion: Correction of anterior spacing along with proclination and missing lateral incisors can be achieved with canine substitution with satisfactory aesthetics. Introducción: el tratamiento de hIpodoncia involucra a incisivos laterales superiores en pacientes de ortodoncia, pudiendo plantear un desafío en el manejo ortodóncico de estos pacientes. La substitución canina es un método clínicamente aceptado en donde los caninos son movidos en la posición de las incisivos laterales y posteriormente su morfología es cambiada para parecerse a la incisivo lateral. 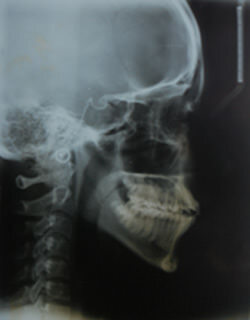 Método: un paciente femenino de 18 años presentó ausencia bilateral de incisivos laterales maxilares, diastema en línea media y espaciamiento de los dientes anteriores superiores. Las radiografías de pretratamiento (Panorámica y Cefálica) fueron tomadas. El plan de tratamiento implicó la substitución de los incisivos laterales ausentes con los caninos maxilares. El paciente fue tratado con la técnica MBT. Finalmente se tomaron los registros al final del tratamiento y estos se compararon con los de pretratamiento. Resultados: los caninos han sido movidos a la posición de incisivo lateral y han sido cosméticamente tratados para parecerse a incisivos laterales con resultados satisfactorios. Todos clos cambios dentoalveolares y esqueléticos han sido realizados sin ningun otro dispositivo extraoral o intraoral suplementario adicional. Conclusión: la Corrección del espaciado anterior junto con proclinacion y ausencia de incisivos laterales puede ser conseguida mediante la substitución canina con la preparación estética satisfactoria. 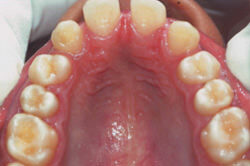 The incidence of missing teeth in the oral cavity has been considered as a progressive step in evolution (1). According to a theory proposed by Butler known as the Butler Field Hypothesis the most mesial tooth in an arch is the most morphologically stable tooth and the abnormal morphological variation increases progressively to the most distal tooth in the arch (2). This theory was proposed for mammals and was adapted by Dahlberg who applied this principle for human beings and divided the human dental arch into different developmental fields and said that the mesial tooth in each developmental field is the most morphologically stable tooth in the arch(3). 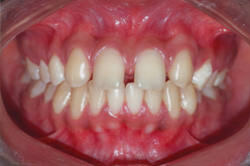 Management of hypodontia especially involving upper lateral incisors in orthodontic patients can pose a challenge in orthodontic management. Management of cases with missing maxillary lateral incisors has many options which includes the replacement of missing teeth with the help of a prosthesis or implant both of which have their drawbacks According to. Dr. Kokich the most aesthetic and functional treatment option for management of a missing maxillary lateral incisor is canine substitution . Though the canine can be re shaped to have an aesthetic appearance of a maxillary lateral incisor, sometimes a Crown or a veneer may have to be placed on the substituted canine to improve easthetics (4).Correction of proclination of the anteriors along with canine substitution would require the protraction of the maxillary posterior segment in cases which exhibit class I molar relationship. 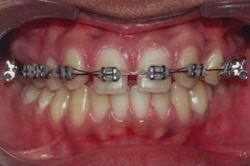 An 18 year old female patient exhibiting a class I molar relation on the left side and an End-on molar relationship on the right side as well as an End on canine relationship bilaterally reported to the department of Orthodontics at Yenepoya University. 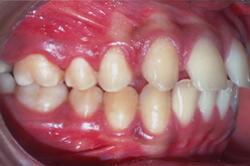 This patient also exhibited missing maxillary lateral incisors bilaterally, midline diastema and spacing in the upper anterior teeth and rotated maxillary premolars.The patient had satisfactory periodontal health, good bone support and adequate attached gingiva, she also had good oral hygiene. 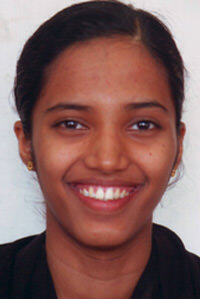 Intra-oral periapical radiographs were acquired. 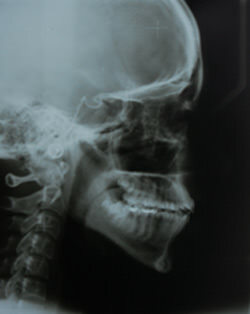 On radiographic investigation it was determined that the patient exhibited hypodontia with respect to the maxillary lateral incisors. 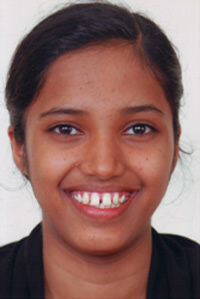 The treatment plan involved substitution of the missing lateral incisors with the maxillary canines . 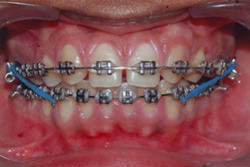 The patient was treated with the MBT technique (.022 inch slot). The leveling and aligning was carried out with 0.016" HANT (Heat Activated Nickel Titanium) and 0.019" x 0.025" HANT arch wires. This brought about a mesialisation of the posterior segment along with the maxillary first molar to a class II molar relationship bilaterally .The maxillary canines have been altered to conform to the shape of the lateral incisors and the maxillary first premolars have been altered to resemble the maxillary canine. 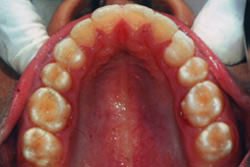 The cephalograms are evaluated for inclination and position of the upper incisor and lower incisors. 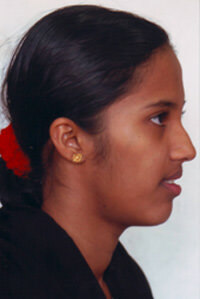 The post treatment evaluation shows an acceptable overjet and overbite. The bucal segment shows a class I canine relationship bilaterally and a class II molar relationship bilaterally. Proclination of teeth, a lack of space and a class III skeletal tendency accompanied with missing maxillary lateral incisors needs an individualised treatment plan. 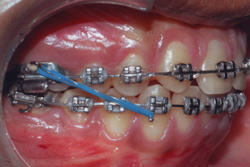 Protraction of the maxillary buccal segment is one of the methods for gaining space and has been used here effectively to bring about desired changes. 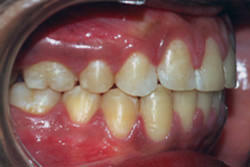 The canines have been moved to the lateral incisor position and they have been converted to resemble lateral incisors with satisfactory results. 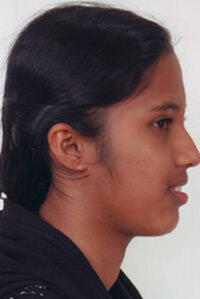 All dentoalveolar and skeletal changes have been brought about without any additional intraoral or extra oral device. Butler PM 1939 Studies of the mammalian dentition . Differentiation of the post- Canine dentition . Proceedings of the Zoological Society of London .109:1-36. (Dahlberg AA 1945 The changing dentition of man . Journal of the American Dental Association.